Laying out the shape of the new rain garden. Last fall we built a rain garden that collects rainwater that runs from the roof and driveway. Normally this water would have run down the slope behind the house into a creek and off the property. Now it fills up the rain garden and soaks into the ground in a few hours, replenishing the groundwater that feeds our well. In the midst of a serious drought that’s pretty comforting. It worked so well, we’re creating mini-rain gardens and swales all over the property now to slow down the flow and allow it to soak into the soil. I have a half acre of garden that I water through the dry summer months, so it would be hard to store enough water in a cistern or in plastic tanks to take care of 4 – 5 months of watering. And the house is down slope from the garden so I couldn’t figure out a way to collect it in tanks and get it uphill to the garden. I chewed on that problem for a couple years. 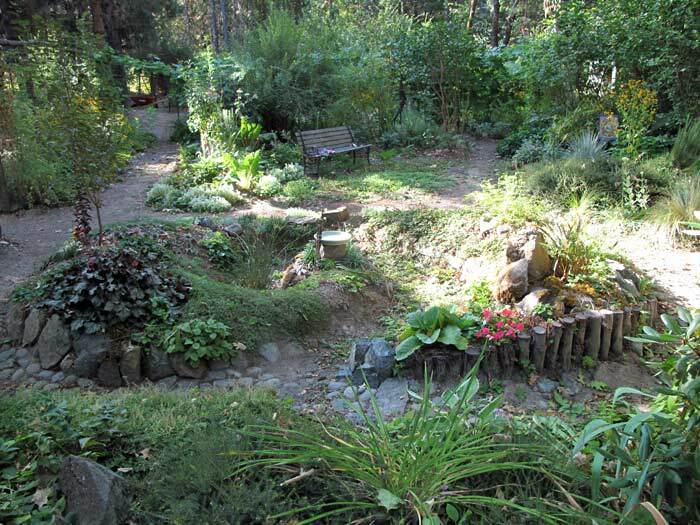 Then, in the process of looking for answers online, I ran across the concept of “rain gardens”, and the fact that they hold water, allowing it to soak into the soil and replenish the groundwater. 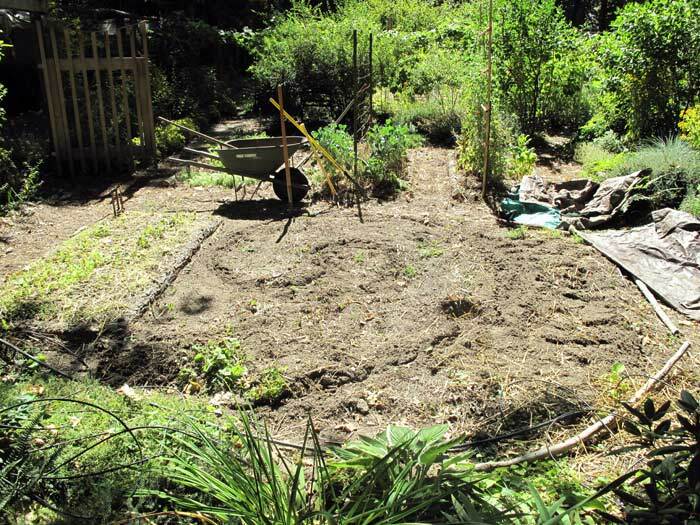 Around the same time I came across a story by Geoffrey Lawton of Permaculture fame, about a property where they put in a series of swales running down a slope. After a couple years of collecting rainwater in the swales, a spring popped out on the hillside! Suddenly the idea of saving rain water in the GROUND seemed like the simplest and most natural solution! 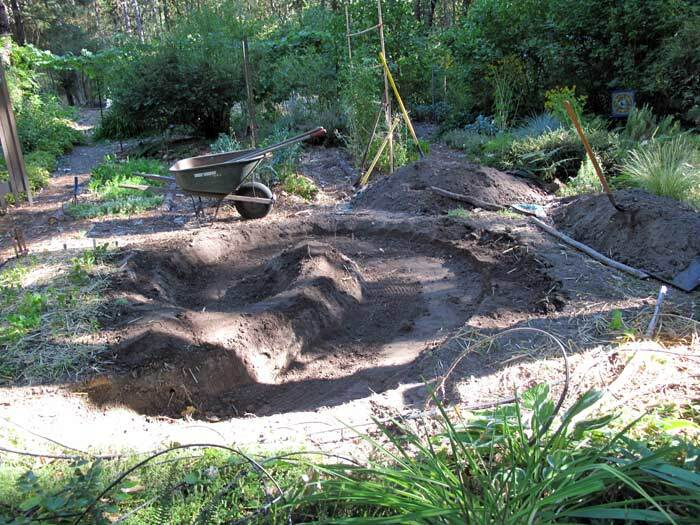 Rain Garden project – digging started. Rain gardens were created originally for a more urban/suburban setting, as one solution to the problem of the massive amounts of rainwater that flow from roofs and driveways, patios and streets into storm drains and from there into local streams and rivers, carrying all sorts of nasty pollutants picked up along the way. Before humans created so much impervious surface – rain used to soak into the ground in forests, meadows and prairies – continually recharging the aquifers and groundwater which in turn fed streams and rivers. Now we are using up the water in the these aquifers faster than it is being replaced. Much faster. The pollution-filled water that runs off the hard surfaces and into streams and rivers is causing un-natural flooding and all sorts of serious problems for fish and wildlife. Starting to add log edges. 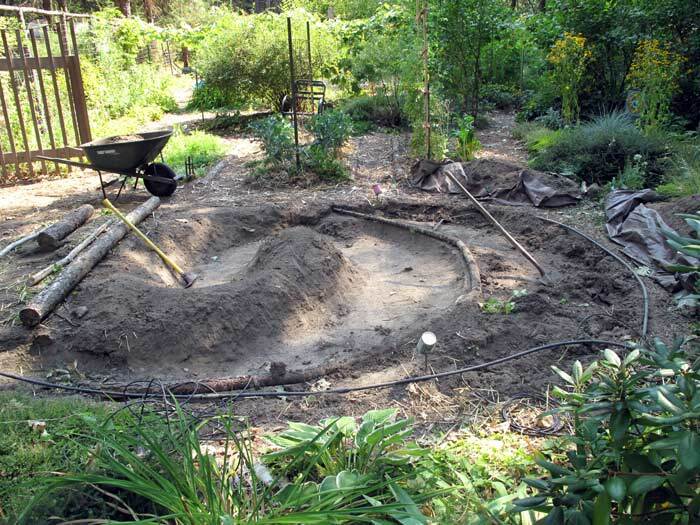 Next we added logs to the center of the berms, creating “hugelkulturs” on either side. There are campaigns all across America, Australia and the UK, working to encourage homeowners and businesses to build rain gardens to deal with this runoff from impermeable surfaces. 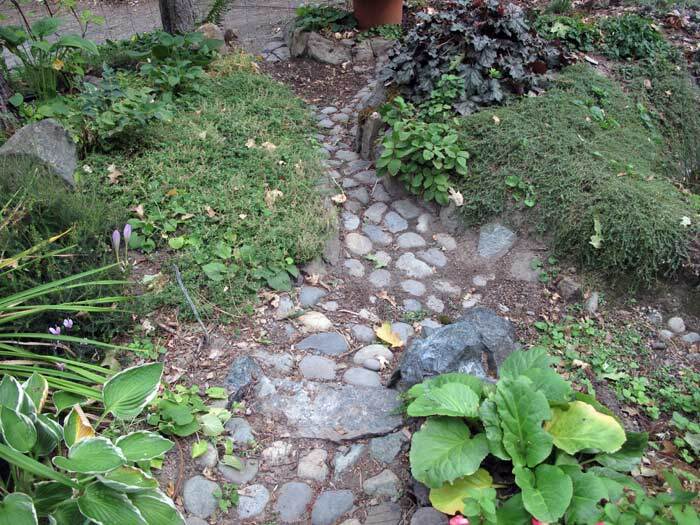 I read of at least one area that is now requiring any new home or business being built, to include a rain garden big enough to handle all the rain water from the roof, sidewalks, driveways and parking lots. The idea is really fairly simple. A depression is dug at the lower end of a property – or somewhere at least 10 feet from the house or building, 25 feet from a septic tank and away from underground utility lines. It is then partially re-filled with light compost, sandy loamy soil and gravel, and planted with mostly native perennial and annual plants that can take being very wet occasionally. The water from the roof is directed to the depression. Beyond that there are a number of ways that you can design one. Finished Rain Garden one year later. You can see the same black-eyed susans blooming in the background on the right! 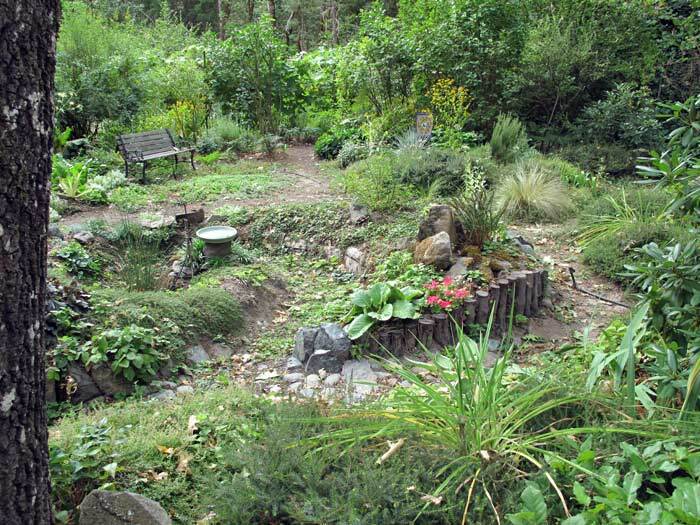 If you do an “Image” Search for “rain garden” online, you will see many interesting examples. Ours was created to be a decorative part of the landscape and Bryon did some artistic things with rock. 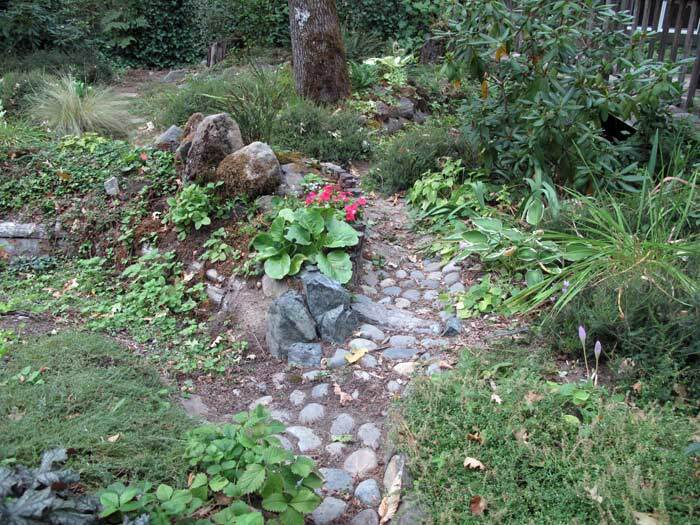 Many rain gardens you will see images of, are large beds that are hard to distinguish from a normal flower bed. The University of Wisconsin has a free manual that’s an excellent introduction to the basics of building one. You will find many resources online, including videos. Some may overwhelm and confuse you. But Wisconsin’s gives you the basics. From there you can get as creative as you want. You don’t need to bring in heavy equipment to do this, although some are built this way. Granted, moving a lot of dirt is not light, easy work. But it can be done without tractors and backhoes. If you can’t do one big enough to capture all the rainwater from your roof and driveway you can create one large enough to at least capture SOME of it. Or create a couple small ones in different parts of your property. Two things it might help to know: These are NOT ponds. The water is meant to drain into the soil within 24 hours or less, so they are not breeding grounds for mosquitoes. If you live in town and are not on a well, building a rain garden is simply a responsible thing to do. You will be benefiting everyone, by dealing with the results of rain falling on your impermeable surfaces and in the process helping to recharge the groundwater we all use. It’s a bit like recycling. One rain garden won’t make a big difference, but if lots of people build them, the effects can be profound. I read a story of a neighborhood that was beginning to suffer from regular flooding of the roadways. The neighbors got together and all built rain gardens on their properties and solved the problem! We all use the groundwater. It supplies the water used to grow the food we eat, and for every aspect of our lives. Everything you eat, everything you wear, every product you use, every living plant or animal you see anywhere around you is dependent on water for its creation… fresh unpolluted water. And then there is washing, cooking, and toilets! It’s rain water that sustains much of that supply of water that is then stored in the ground ready for our use. Rain Garden overflow to the west. Rain gardens are a small sustainable way we can actually DO something to balance out the water we use. 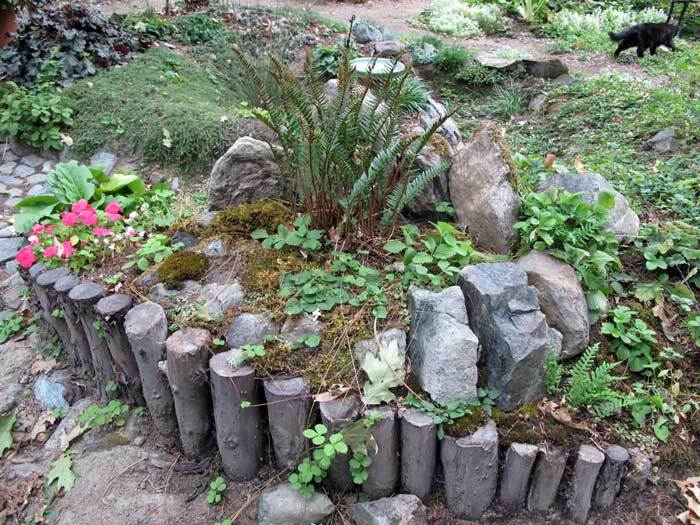 If you have a well, rain gardens and swales are a directly important tool for making sure the groundwater that feeds your well is regularly recharged with the rain that falls on your land. It’s simple, natural and sustainable. 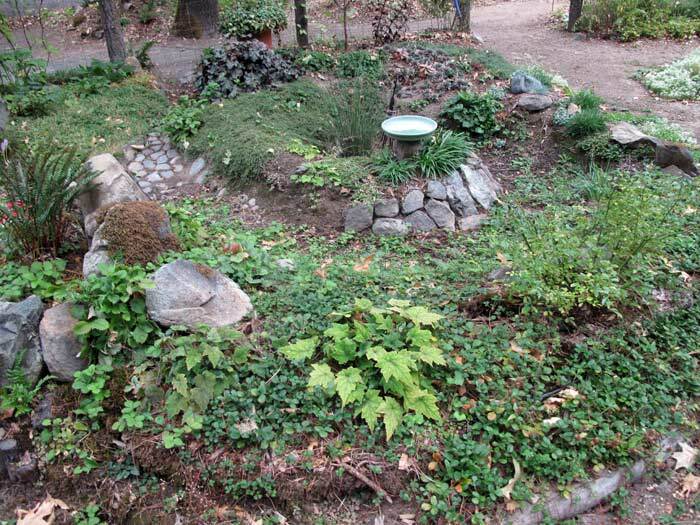 Rain Garden and new “zen garden” in the background – with a bench!